Langtang trek is one of the less demanding trek route in Nepal that takes you so close to langtang lirung. The langtang trek comparatively very easy, cheaper and possibly complete in 5 days best for beginners hiking in Nepal. Visit Langtang is a comparatively less effort that it seems you are in a dreamland of nature. Furthermore, Langtang trek 7 days itinerary is the best option for all age trekkers to explore in any months. The langtang hiking is one of its kind of adventure nearby Kathmandu valley comprising an excellent blend of nature, culture, and magic Himalayas. An ultimate guide Langtang trek offers the itinerary information for your trip plan, best months to visit and cost accordingly comparing cost and other Langtang village before and after the Nepal earthquake 2015. If you are solo, you can still travel Langtang. The trail to tserko ri ascend uphill is nice and well rebuild until kyanjin gompa. Visiting Langtang glacier, you might continue your journey to kyanjin ri in the next morning for sunrise. Make your plan in a proper way reading langtang trek blog as describe in our home page. Basically, the distance from Kathmandu to Trishuli is approximately 72 kilometers and 50 kilometers further to Dhunche. Moreover, the distance until kyanjin gompa is roughly 25 kilometers. Thus, the final distance from Kathmandu to Langtang is 147 each way. However, return to langtang nepal trek is an outstanding trek route that locates north of Kathmandu to the direction to the kerung boarder. A place to possibly discover Red Panda an endangered animal of Nepal. Visit langtang map as given here to find even more in details. 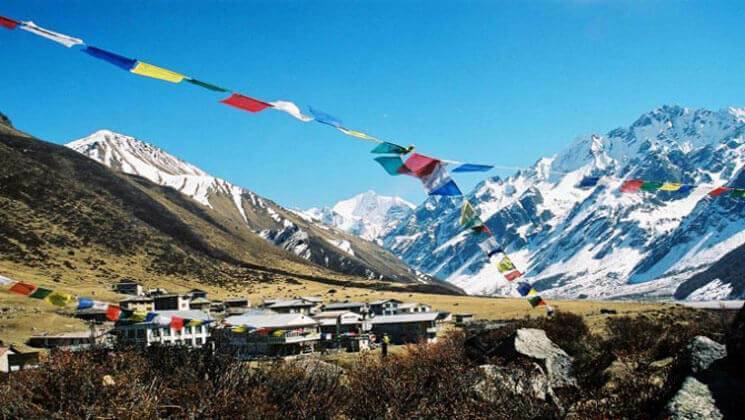 Moreover, langtang national park is home of the several wildlife animals; Monkeys, Himalayan black bear, musk deer, snow leopard, Himalayan wild goat. It is also the best place to research plants, wildflowers, orchids, magnolia, and birds. At spring the trails turn into the majestic colorful valley because of blooming Rhododendron. Book your ultimate trek route with professional service for just langtang valley or another trip langtang gosaikunda trek in Nepal. You can find the low cost even you solo travel, Langtang trek 7 days is most popular rather 8 days. Besides that you will have the best view of mount Ganesh Himal family, mount lantang lirung (7,246m), mount Langtang-ri, mount Langsisa peak, Langtang Himal, mount Ganjala peak. Langtang is a place to trek if you want a short trip with “all the excitement of the Himalayas”. It is one of the most accessible trekking areas near the Kathmandu Valley offering short day hikes or week-long (or more) treks into the lake district. Add some days you’re up for 70 glaciers and roughly about 108 high altitude lakes such as Gosainkunda, Parvatikunda, Bhairavkunda, and Dudhkunda. You can see Yak and sheepherders along the langtang trek itinerary. No matter whether you are trekking as an individual or as a group style, you can discover this valley at any time through our the year. Thus, use our expertise to design your ultimate experience for langtang trekking route, and receive hand-crafted trek details built by our expert local guides. Return to Langtang villages combine with Tserkuri and Kyanjin ridge with new trail trek itinerary compared to most walks in this region leading up to the Langtang glacier. The particular route Langtang trek is designed for world explorers who wish to hike to kyanjin gomba – Langtang glacier with a normal plan than take a look at this itinerary. As you are landing in Kathmandu, Tribhuwan International Airport (TIA), we will receive you with private vehicle and transfer to hotel in Kathmandu serve with breakfast plan. Our representative will give you information about langtang trek programs. Day 02 Overland drive to Syabrubesi Bazaar (1,460m/4,788 ft), 5 hours. After breakfast, catch up the Kerung coach for Syabrubeshi with your langtang trek guide and porters. Enjoy seven hours scenic drive through Trishuli highway with beautiful small villages, river valley, and mountains. The bus stops roughly about 30 minutes on highway restaurants for lunch at Trisuli Bazaar. You can reach Syabrubeshi another 3 hours of driving. There is an optional drive that can take you to only 5 hours express drive to syabrubesi without passing Dunche bazaar. You start your walking at your own pace and the trail ascends for around two hours through the forest followed by a climb of about an hour to reach Bamboo village where you’ll stop for lunch. The trail is nice and you follow the upstream and can be seen birds life around the bushes. Besides, that wild Bee hives hanging on a cliff are another attraction for the visitors on walking. From here you will again steeply climb through the bamboo forest to reach the Lama Hotel. Today you will have a pleasant walk and follow the trail through rhododendron and pine forest for around three hours to reach Ghoda Tabela where you will stop for lunch. Ghoda Tableta station is locating around of dense wild habitat and herbal plants. After lunch you will walk along a scenic trail takes you to Langtang village where you will relax in the evening. Have in mind, Langtang whole valley was destroyed by a massive Earthquake disaster in last April 2015 and then rebuild again, therefore, you will find the latest lodges with modern facilities on lodges. Kyanjin Gompa is the last human inhabitants of your trek located at an altitude of 3,817m / 12,519 ft above sea level. If weather permits, you can see the great view of Mount Ganchempo and well as Mount Langtang Lirung. While you are here, you can hike to Kyangin ri for a better view of mountains or walk to visit Yak cheese Factory, Kyanjin Monastery, and local houses. Hike to Kyanjin ridge or kyanjin ri hiking is a best day hikes to get super view of langtang Mountain range includes mount Langtag lirung, mount Langtang ri, Langsisa pass, Langsisa kharka, mount Langtang ri, mount Ganjala peak, mount Yala peak and many other boarder peaks. Before your journey to Langtang begains, check about the kyanjin gompa weather. Besides that, if you are interested your mountain trek guide will take you to climb Tsherko ri (5,150m/16,841 ft) peak to experience even better views of Langtang Mountain range of an option. tsergo ri is the most demanding high hill station to get an outstanding panorama of Langtang range in a 360-degree angle near Yala peak base camp. After breakfast, we trek downhill walking from Kyanjin Gompa to Ghoda Tabela passing numerious tiny houses and villages which some of them were completely destroyed by Earthquake disaster in 2015. The walking journey of today takes you around six hours with pleasant and scenic landscapes. Descend downhill to reach Syabrubeshi passing via lama hotel and Bamboo through previous rhododendron forest and along with Bhotekoshi river banks. Syabrubensi is a main downtown of Langtang region and main gateway to visit Kerung boarder. After breakfast, catch your coach to return Kathmandu valley. After reaching in Kathmandu, you will be taken to your hotel. In the late afternoon, you can stroll around Thamel, the major tourist destination of Kathmandu. You can do some last minute shopping of souvenirs for your family and relatives. At evening drop you to the kathmandu international airport for your further journey. How much does langtang trek cost? Exploring langtang valley trek cost is available on USD 625 per person but of course, the trip price will vary according to group size. For the deluxe and luxury trekking tour plan, we add 3-star category hotel deluxe air-conditioned room in Kathmandu (BB PLAN) and with attached bathroom while on trekking on possible places. AND WE ARE OPEN TO CUSTOMIZE YOUR TOUR AND PACKAGES PRICE AS PER YOUR REQUIREMENTS. International tour leaders are highly encouraged to get discount and attractive complimentary. 1 night’s twin sharing tourist standard accommodation in Kathmandu with breakfast plan. Kathmandu to Syabrubensi and from Syabrubensi to Kathmandu as a round trip by bus transfer. We can organize private express langtang trek starting at any date that works for you. Please contact us for more information. Is pick up service available if my arrival day in Kathmandu? Do I need the experience to do express langtang trek? Answer: Langtang trek is suitable for keen trekkers/walkers who are able to walk around 4 or 5 hours in a day, with a lightweight daypack. For this trekking, if you have about the little experience would be better. What kind of accommodation can I expect on express Langtang trek? What kind of food can I expect in Langtang trek? What opportunities will I have for a shower along Guide for Langtang trek? How do I get drinking water on easy langtang trek? Answer: You can buy bottle Mineral water along the trekking routes. But we advise against buying mineral water in plastic bottles, as currently there are no provisions for disposing of these. Instead, manage your drinking water by buying some aqua purification tablets or chlorine tablets. Besides that, if you are on a camping trek than we provide you boiled water or chlorine tablets to purify the normal water as the normal water is available in campsite/along the way. Answer: Along the lodge trek, there will be more chances to charge the battery. We recommend you bring an extra pair for in case. Remember to bring your adapters! Is there any communication facilities on langtang trek? Answer: Yes! Along the trek, you can get telephone services as well as internet services, you can talk to your family. Can I use credit cards in trekking? When should I book my trip and what is the payments terms? Who will carry my luggage on langtang trek? How long do I have to walk on each day? Answer: It depends upon the areas you are walking and the length of distance you cover each day, but it can vary greatly due to a gradient, terrain, and altitude. Roughly, you have to be prepared to walk roughly about 5 or 6 hours each day. Do I need walking polls? Is there any chance to hire a local guide or how to hire a private trek guide in Langtang? Answer: Yes. If you do not like to book the complete package trip, you can still hire our private trek guide to make your holiday best. Langtang trek offers great view of langtang Himalayas within 360 deg angle from Kyanjin ridge. As the information stated above is just a guideline as a standard template what we provide you, however, the trip can be customized at your request to accommodate your specific requirements. Local politics, landslides, cancellation of local flights, weather, transport or a multitude of other factors that are beyond our control can result in a change of itinerary during on trip. It is, however, very incredible that the itinerary would be extensively altered. If alterations are necessary the leader will decide the best alternative option, taking into consideration the best interests of the whole group. Where a change does occur, we do everything we can to minimize its effect, but we cannot be responsible for the outputs of changes or delays. Opportunities for challenging trekking or hiking and pleasant strolls are scattered all over this planet; you just need to know where to find them. We believe in the quality of services. Your safety and satisfaction is our concern. We are a team of professional, experienced, well trained and licensed local guides who know the destination much better than others. Not only this but also we give benefits to the local communities and helps to conserve natural resources which deduct in costs and consumption. We did a trek through the Langtang region called the langtang Panoramic Trek – absolutely amazing views. Landscape changes frequently from rice fields to waterfalls to snow capped mountains. Our trek was led by Ram who did a fantastic job teaching us about the history of the region and mountains. He knew the area so well and always knew the best tea houses to stop at for food or lodging. I would highly recommend Ram and the Gokyo Trek team to any planning a trek in Nepal. – Corina Schreiner, Berlin Germany. Excellent and amazing Langtang Valley trek, highly reccomended!! Me and my friend booked Langtang Valley trek throw Gokyo Treks and we dont regret anything, because everything was just PERFECT. We also customized little bit the trip with our guide Bishnu and everything went very well. So if you want to go trekking to Nepal i highly reccomend use Gokyo Treks services, because there are professionals who know how to organizise everything.- Mikk Meimer, Estonia. We are a team of 4 Germans from Europe and we have just finished Langtang trek with the professional guide Ram with Gokyo Treks & Expedition and everything went excellent! Our Guide Ram was extraordinary and our porters Dipendra and Manoj were just friendly. We travel Nepal 2 times already but we didn’t have time for trekking but this time we spend our 7 days Langtang Trek with guide and porters. They were all very good people. No doughts, we are again planning our next trip to Annapurna with Gokyo Trek agency in coming October – November. If you are thinking or searching for a reliable company than this agency is the best for sure and their prices are competitive comparing others.- Herman Tour, Austria.